I watched the Super Bowl with friends and left for home late in the fourth quarter when it was a tie; the score was a low 3 to 3. I am aware this says something about my interest. The truth is the party food—spicy chicken wings and spare ribs—had my attention more than the game. Even so, I was curious to know the outcome and turned on the TV when I walked through the door. No surprise: the Patriots had won. 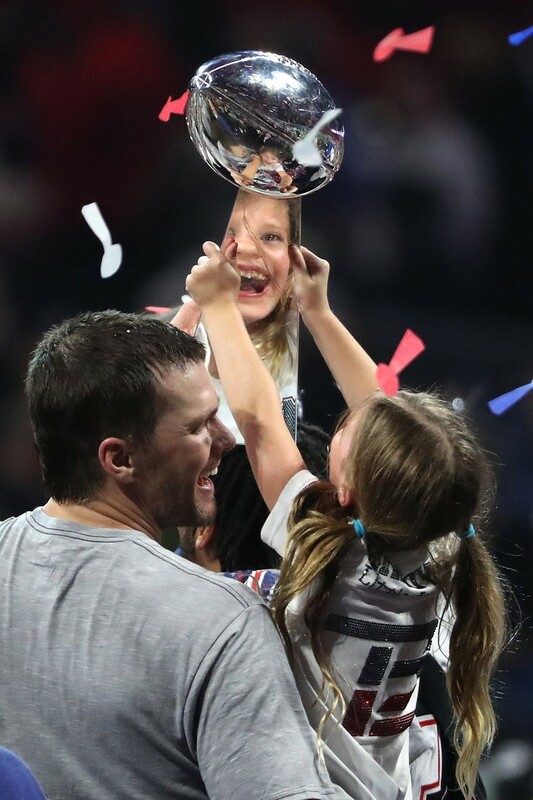 There is nothing not to like about Tom Brady, which may be why so many of us outside of New England were rooting for the Rams. He is perfect in every way. If he had an underdog story, some glaring deficiency, cheering for a win might have been easier. He is athletic, intelligent, handsome, well-spoken and incredibly disciplined. Plus he is in his 40s and showing no sign that he is in his 40s. We have heard this before. Every Oscar and Grammy win ends with the celebrity on stage thanking “my husband” or “my wife” or a significant other, and then kisses are blown in the direction of the camera for their children watching at home. I am not saying that I don’t believe Brady. I do. A few minutes later, he was holding his daughter in one arm, with her reflection in the Lombardy Trophy that he held with the other. Audiences were smitten by the affection, and that’s when I found myself rooting for him. Maybe when Brady is 50, he will look 40. Regardless, one day age or injury will take him out of the game. He will not always be a football player, but he will always be a father. And if he’s living right, the woman standing beside him will be his wife when he is old and the best he can do is throw the ball from his chair to the TV set. I believed Miranda Lambert when she thanked her husband, Blake Shelton, for his love and support when she won Country Music Award’s Entertainer of the Year, even though she filed for divorce a few months later. We are not always successful at keeping our families together, but that doesn’t mean we don’t understand they are the source of happiness. Recently a social worker told me of the extreme measures mothers will take to be with their children, even when they are unfit. This week a husband and wife sat on a couch as they told me the results of his tests; the PET scan lit up with cancer. His survival is dependent as much on their love, as it is on the chemical therapies and pharmaceutical cocktails doctors will give him. When Jesus speaks of family, it is not of their being held together. Simon and Andrew leave their father behind. I see the old man alone in his boat and holding his nets. Later in the gospel, Jesus says to his disciples, “for I have come to set a man against his father and a daughter against her mother … and one’s foes will be members of one’s own household.” On this teaching I am hoping for a pass, because I am rooting for families. I’d rather not see them divided. So, three cheers for Tom Brady. I hope his family wins.